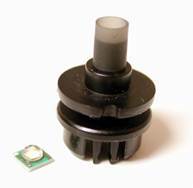 2010/12 - Blog - Count On Tools, Inc.
Count On Tools Inc., a leading provider of precision components and SMT spare parts, introduces its new series of Custom SMT Pick-and-Place Nozzles for CREE® XLamp® XP-E High Efficiency White (HEW) LED components. The new series is manufacturer-approved, based on CREE Inc.’s strict requirements and specifications. By working closely with component manufacturers, Count On Tools guarantees secure picking of all fragile components and accurate placement on the circuit board. The company’s line of custom SMT nozzles was developed especially for CREE XLamp® XP-E HEW LEDs. According to CREE, the XLamp XP-E HEW LEDs upgrade the XLamp XP-E to leading performance levels for diffuse lighting applications. XP-E HEW is designed to enable faster adoption of LED light in cost-sensitive, consumer lighting products. Compared to the standard XLamp XP-E, XP-E HEW can reduce LED count by 50 percent while still delivering the same system performance. CREE LEDs are unique because they require special handling operations to prevent damage to the optical lens. Count On Tools’ SMT nozzles for CREE LEDs are designed to avoid placing mechanical stress on the LED lens by not touching the optical surface during component picking or placement processes. This eliminates the possibility of degraded performance from the LED after the circuit board is assembled. Count On Tools’ custom SMT nozzle designs for CREE LEDs can be applied to any style of pick-and-place nozzle for any OEM or machine type. Additionally, Count On Tools can generally provide a finished nozzle within three to five days and save customers up to 50 percent over OEM designs for custom nozzles. Some nozzle designs can even be made the same day with the company’s existing nozzle tip selection straight off-the-shelf. There are no design fees, and Count On Tools provides free quotes based on the equipment and type of LED being placed. Interview with Curt Couch, President of Count On Tools, Inc.
Count On Tools Inc., a precision component manufacturer specializing in all aspects of the machining industry, has been a manufacturer of high-quality, low-cost pick-and-place nozzles and associated components for the SMT and electronics manufacturing industries for 20 years. Proven engineering expertise, coupled with its commitment to manufacturing excellence and investment in the latest production equipment, ensures that innovation and competitiveness is applied to all of its extensive product range. Q. How has your background in precision manufacturing helped you to create a better product for customers in the SMT industry? A. I have always had the “keep it simple” philosophy. My attitude for approaching new and existing concepts and ideas is with an open mind. Because of this attitude/culture, our entire COT team is able to apply ideas and proven concepts across the board when it comes to picking and placing anything via vacuum. In my opinion, all industries are connected and run parallel with one another, meaning that one needs the other to sustain itself. As a result, useful ideas can come from other industries and experiences. We frequently intermingle and use materials and basic vacuum geometries that are found in high-volume placement platforms for customers with low-volume, high-mix applications. The use of many different materials, coatings, tooling, fixtures and machining components in other industries has taught us that we can apply these same principals to all of the products that we design and manufacture for our customers in the SMT market sector. Q. Do you primarily sell to customers in the United States or do you offer global distribution? A. Currently, we sell our products worldwide, and have done so for many years. We have distribution partners in key global electronics markets, including Europe, Asia, South America and the Pacific Rim. Any area not serviced by one of our partners is handled directly by our headquarters in Gainesville, GA.
Q. What products and services are you currently promoting? Please briefly describe each product. A. Currently, our MYDATA line of spare parts is really taking off. We have expanded this product range to include the full line of Midas and Hydra tools, as well as an array of other consumables, such as filters, replacement tool tips and grease. Count On Tools also has the capability to produce custom nozzles, such as MELFs, flat pipes and grippers based on the original designs. Additionally, we are developing parts and repair services for the Agilis feeders. There is no other source for this type of service anywhere. This will include repairs on feeder springs and plows. We also are developing replacement board lock arms and hydra tool tubes. Another emerging market that has picked up over the first quarter of this year is selective soldering. Currently, we offer replacement nozzles for Ace (KISS), Pillarhouse and RPS equipment. We offer both standard and custom wave flow nozzles. We hope to start developing more nozzles for many of the other machines out there as well. Finally, we are expanding our research and development of LED nozzles and micro-component placing technologies. With the current industry trends showing greater use of LEDs in lighting applications and electronics, we know the need for high-volume placement of these components will become critical for many EMS providers across the globe. Also, the trend for smaller electronic devices with smaller components has helped us to begin designing the next generation of SMT pick-and-place nozzles for micro-components such as the 01005 and 0201 designs. Q. You mention LEDs. These are a hot topic in the industry at the moment. Are you making custom nozzles for them? A. Absolutely. We have been lucky enough to work with leading EMS companies worldwide, as well as the top LED manufacturers, to create custom nozzle designs that will work in any machine. This has allowed us to transition these components into high-speed, high-capacity assembly equipment for faster production and greater efficiency. If any company is looking to transition LEDs into high-volume assembly, we have the technology to make it happen. Q. We understand that you also provide custom nozzle engineering for odd-form components. What type of benefits can a customer expect from using your company over an OEM for this type of service? A. The most important benefit that we can offer customers is a fast turnaround time for custom nozzles. Generally, we can have nozzles ready in just one to two days after receiving samples of the component. This is the fastest custom nozzle service in the industry. We also provide free quotes and designs, eliminating extra worries and fees for customers. We guarantee the functionality of our custom nozzles because we work directly with the OEMs and component manufacturers. Our company also has a multi-platform proficiency that is crucial to the design of custom nozzles. We are not afraid to take technology from one nozzle manufacturer and use it in a completely different machine. Basically, the process is the same for every SMT machine available. Finally, we offer affordable pricing on all of our custom nozzles, sometimes up to 50 percent less than our competitors. This all combines to create a unique service that is our own. Q. What other types of odd-form components do you make nozzles for? A. We have made literally thousands of custom nozzles over the past 20 years. Some of the more common ones include 01005 chips, 0201 chips, sockets, lamps, bulbs, deep socket connectors, switches, pins, heavy components, pre-assembled circuit boards, heat sinks, film, labels, solder balls, shields, speakers, oversized components, antennas, connectors and more. We don’t just sell nozzles, we offer solutions that allow our customers to place any odd-form component without investing in new specialized equipment or resorting to hand assembly. Our goal is to optimize efficiency and save our customers money by maximizing the capabilities of the SMT equipment that they already use for production. Q. Do you offer any warranties with your products and services? If so, please explain. A. Customer satisfaction is our number one priority, so we stand behind our products 100 percent. If customers are not satisfied with the quality, durability or performance of our products, we will send them a free replacement that meets or exceeds their expectations or we will offer a full refund of the purchase price. Q. Why should customers looking for high-quality, low cost SMT nozzles and consumables choose Count On Tools over other suppliers? A. The main reason is because our products are made in the USA. Not very many companies can claim this anymore. We have been able to maintain our competitive edge because of our investment in the latest CNC equipment and more importantly, the people. It’s that American spirit that all of our staff maintains. We are proud to keep this heritage of “build it here, buy it here” alive. We offer a broad-brush approach to pick-and-place, dispense and selective soldering that no other company can offer. We are compelled, not hindered, to incorporate the use of many different materials, concepts and cost saving measures to provide fast service that exceeds expectations for all customers. Each new accomplishment means that the next customer will benefit from the never-ending source of information and new ideas. What works for one will work for another, regardless of OEM or platform type. Customer service is number one no matter what. I believe in treating people and customers the way I want to be treated myself. No customer or problem is too small or big to receive the attention it deserves. This type of service is very important in our industry; it could mean the difference between encountering enormous downtime cost or long-term savings. In some cases, we can design, build and ship a custom vacuum nozzle to place an exotic/odd-shaped component in as little as one day. The use of these and many services offered by our company can reduce costs associated with labor and, more importantly, our customers’ end product reliability and market success/profit.